Target Robot platform with a soft target. As automotive manufacturers and technology companies like Google bring us ever closer to the inevitable driverless car, the safety systems and Advanced Driver Assistance Systems (ADAS) built into vehicles exhibit more and more autonomy. A national institute for automotive testing recognized that testing today’s collision avoidance systems safely, accurately, and repeatably requires that the test system itself possess programmable, autonomous driving capability. Perrone Robotics developed the Autonomous Vehicle Test System (AVTS) as part of an expansion at the institute in Virginia. Testing systems such as Crash Imminent Braking (CIB), Dynamic Brake Support (DBS), and Autonomous Emergency Braking (AEB) requires putting the vehicle under test into real-world conditions where a crash is imminent to see how the crash avoidance systems perform. Doing this safely, accurately, and repeatably is a challenge. Clearly if you simply drive a car toward another car to see how the safety system performs, you run the risk of injuring people and damaging property. For testing at low speeds with stationary hazards, it may be acceptable to have a human driver approach the obstacle. However, testing according to standards put forth by organizations such as the National Highway Traffic Safety Administration (NHTSA) and European New Car Assessment Programme (Euro NCAP) requires not only higher speeds, but also with moving vehicle hazards in the test environments. Looking ahead, the institute realized they needed a system that looked and moved like a car, which means traveling up to 55 mph as well as exhibiting car-like steering, acceleration, and braking. And of course all of this high-speed movement must be accurately controlled and repeatable to ensure that tests are performed the same for subsequent test runs and across different vehicles being tested. Another requirement the institute had was the ability to operate on a covered track; that is, without dependence on GPS for location and heading information for navigation. The institute surveyed solutions for ADAS and crash avoidance testing in the marketplace. The initial work Perrone Robotics performed for the project was researching how to adapt existing platforms to meet the specific testing requirements. Top speed of targets were generally limited to under 40 mph. The robotic driving options tended to be piecemeal offerings rather than fully integrated test systems. They also didn’t allow for the human driver to sit comfortably in the vehicle and regain control easily when needed. Almost all the systems we looked at required GPS for autonomous navigation, which is not available on the new covered track. 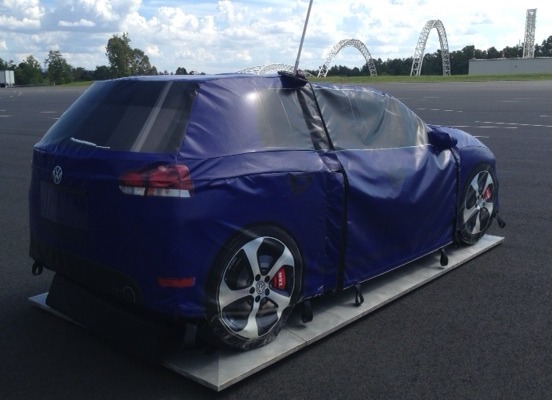 In order to address these testing challenges, the test institute contracted with Perrone Robotics to develop a robotic test system to meet requirements for safety, accuracy, and repeatability, as well as performance requirements set forth in NHTSA and Euro NCAP test profiles. Additionally, they required that the system perform under their new covered track as well as on the outdoor track. This means that the test system cannot rely on GPS for positioning and navigation. To meet the institute crash avoidance test needs, Perrone Robotics developed the Automated Vehicle Test System (AVTS), an integrated system including an autonomous Target Robots and drop-in actuator kit (DAK) systems of sensors and actuators to robotically drive the vehicle under test. The Target Robot can accommodate a wide array of payloads such as the soft targets used at the VRC. These strike-able targets are knocked off in the event that the collision avoidance system of the vehicle under test fails to prevent a collision. The vehicle simply runs over the Target Robot base, avoiding injury to drivers and damage to vehicles. Both the Target Robot and test vehicle (under control of the DAK) drive autonomously according to programmed test plans to ensure repeatable testing of the test vehicle’s safety systems. With this system, a tester can repeatably put vehicles onto a collision course at highway speeds and effectively test the collision avoidance technology. Since GPS is not available on the covered track, the system uses the groundbreaking Locata positioning system, which employs a network of ground-based “satellites,” creating a local, versus global, positioning system. With the new kind of test system, the institute is well-positioned to test new and emerging vehicle safety systems. Each of the main components in the institute AVTS system represents a first-of-its-kind achievement. This is the first Locata localization and positioning system fully operational in the United States and it is also the first use of such a system for a robotic or autonomous vehicle application. The DAK – that quickly adapts to any vehicle and allows the human driver to ride comfortably and regain control – is also a novel achievement. And of course, nothing comes close to the 5” high Target Robot platform with this kind of capability for speed, acceleration, and autonomous navigation.